Wooden shingles clad the end wall and pitched roofs of this terrace in the English county of Hampshire, designed as a prototype for affordable, sustainable construction in the area (+ slideshow). 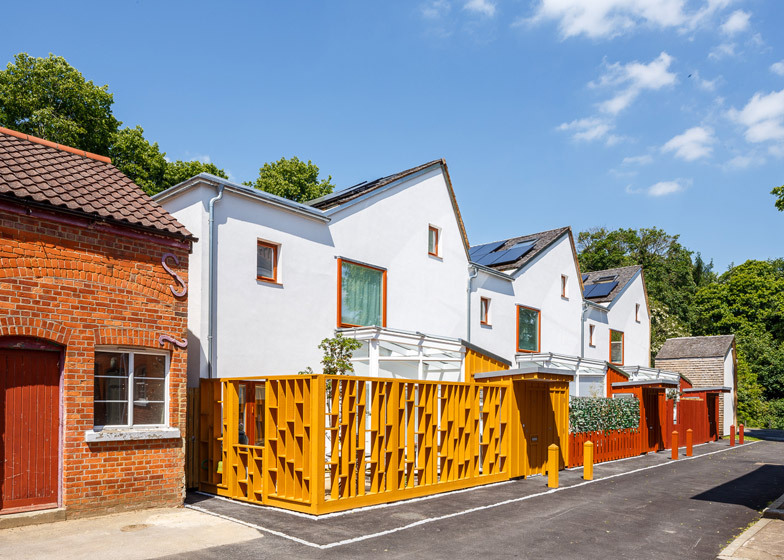 The row of three houses designed by London studio Ash Sakula Architects forms part of a redevelopment project that involves transforming a former military base into a sustainable green town called Whitehill & Borbon. 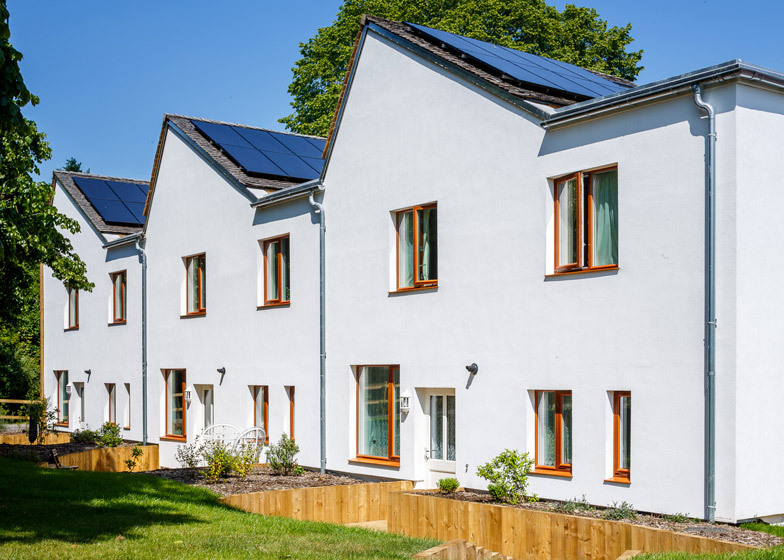 East Hampshire District Council organised a competition to identify an affordable and carbon-neutral housing typology that could be replicated on other sites around the town. The winning proposal by Ash Sakula Architects responds to these criteria while introducing ideas that encourage and facilitate sustainable living. "The form of the houses derives from their context and from the needs of their users," architect Robert Sakula told Dezeen. "We won the original competition because a jury of experts and local residents judged that our entry best provided liveable homes." The three two-storey houses were built for The Radian Group, a housing association that provides affordable rental properties, meaning that the budget had to be tightly controlled. This is reflected in the simple cubic forms and materials chosen for the houses. Within these constraints, the architects aimed to create generous and flexible spaces that can be adapted to suit the needs of different occupants. 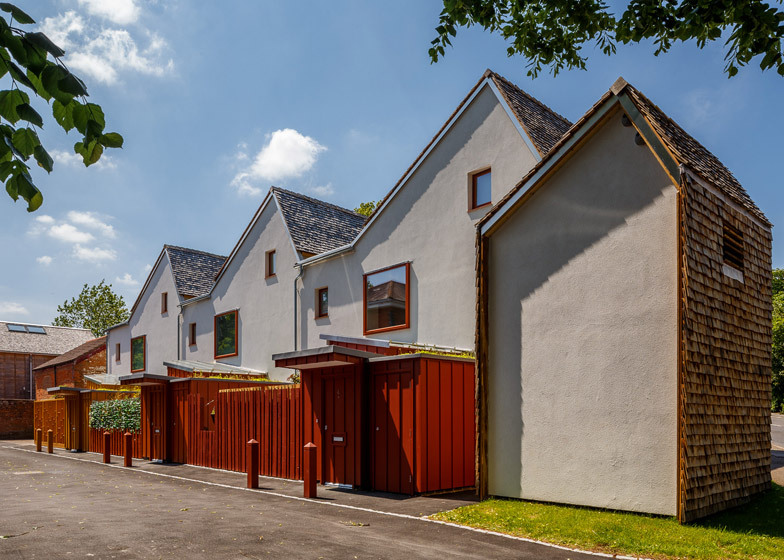 Each of the 94-square-metre homes features an insulated core containing the living areas, with an uninsulated entrance porch extending into the front garden. The glazed entrance area can be used as a boot room, workshop, greenhouse, play area or reception and contains a large coat cupboard. It adjoins an enclosed storage space for tools and bicycles. A staircase separates the kitchen and dining space from the living area on the ground floor. This level also accommodates a toilet that can be converted into a shower room if required. Upstairs, there are two bedrooms, a bathroom and a landing that houses the laundry facilities, including a washing machine and airing cupboards. 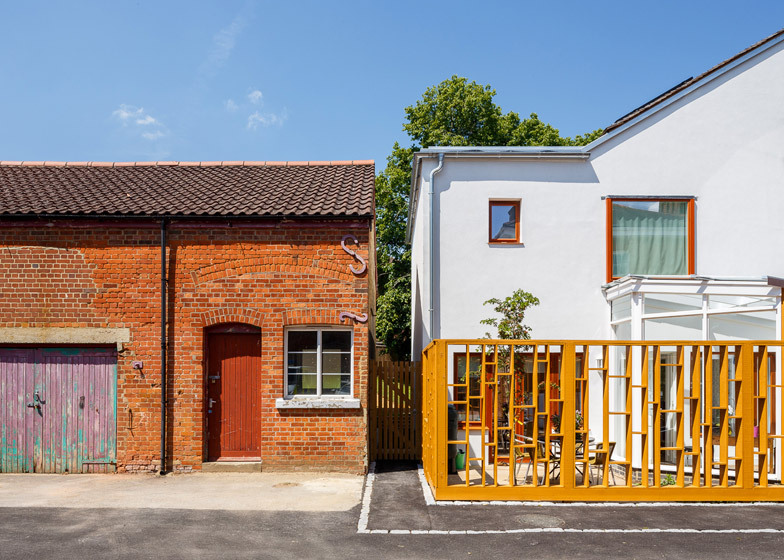 White render and wooden window frames give the buildings a familiar residential feel, while painted fencing provides a brightly coloured detail. The roofs and the end-of-row elevation are clad with sweet chestnut shingles that add a natural texture. 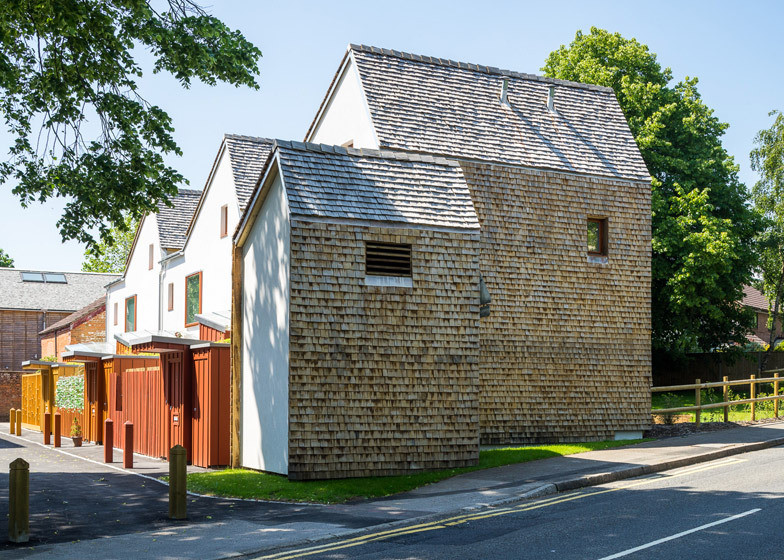 The wooden surface treatment is also applied to the sides and roof of a communal recycling and refuse store that echoes the form of the mews and includes space for nesting bats in its attic and house martins in its eaves. Photovoltaic panels located on the south-facing sections of the pitched roofs collect sunlight that is transformed into power used within the homes. The solar harvesting is supplemented by rows of photovoltaic cells fitted to a former fire station's training tower elsewhere on the site. The positioning of the panels aims to make the most of available east, south and west sunlight, while the panels on the north side help to balance the composition. In addition to the on-site energy generation, the architects incorporated several other ecological measures, including the use of sustainably sourced, low embodied-energy materials and water saving and harvesting. 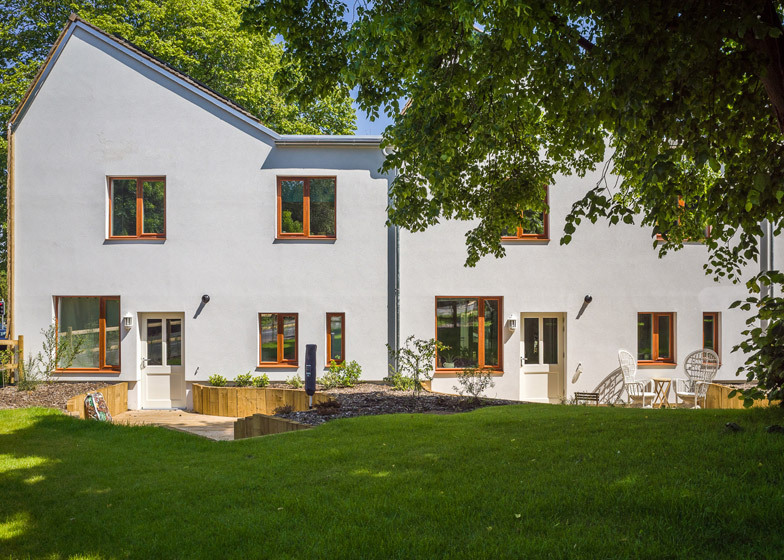 "We avoided green gadgets and went for a fabric first approach: very high levels of insulation to walls, floors and roofs, high performance triple-glazed windows, and mechanical ventilation with heat recovery," Sakula added. "We wanted the houses to be easy to live in without requiring occupants to have to learn all about a whole lot of new gadgetry." Smart meters and energy display units enhance the occupants' awareness of energy consumption, while various aspects of the design are intended to encourage cycling, communal recycling and drying clothes naturally. 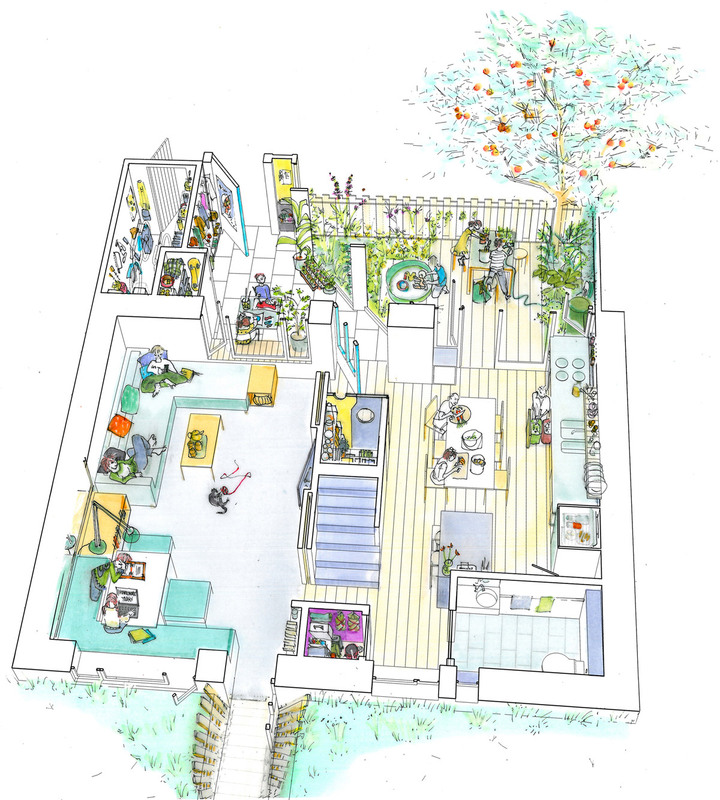 The flexibility of the spaces means the homes can accommodate disabled users and be adapted over time to meet the changing needs of residents. 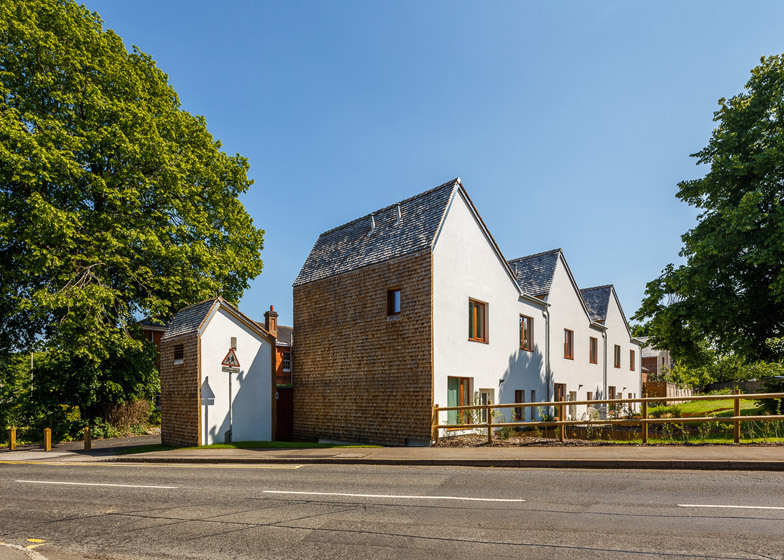 In response to the request for alternative configurations that could be applied elsewhere in the town, the architects demonstrated how the design could be adjusted to enable three- and four-bedroom variants. 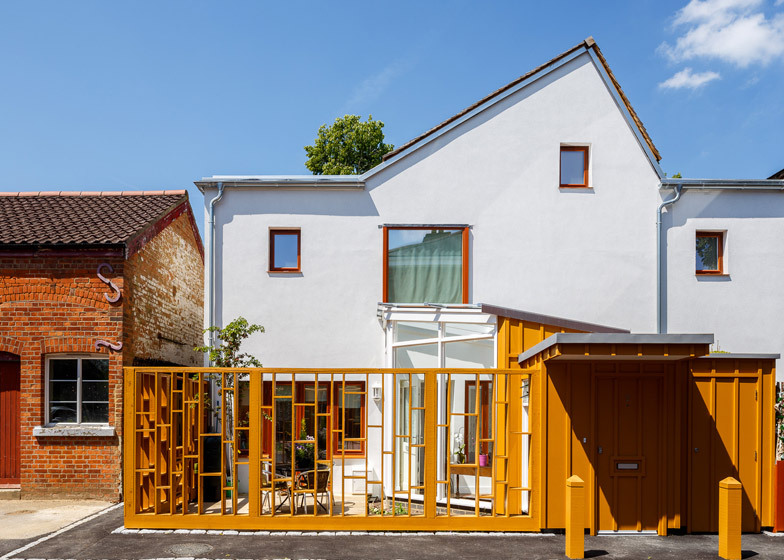 Several recent projects have demonstrated alternative approaches to the issues of affordability and sustainability in new British housing schemes, including a model for factory-built units designed by Richard Rogers for the YMCA charity. "We've been failing to build enough housing," said Richard Rogers at the opening of his firm's scheme. "The supply lags behind demand and buying becomes ever more unaffordable." 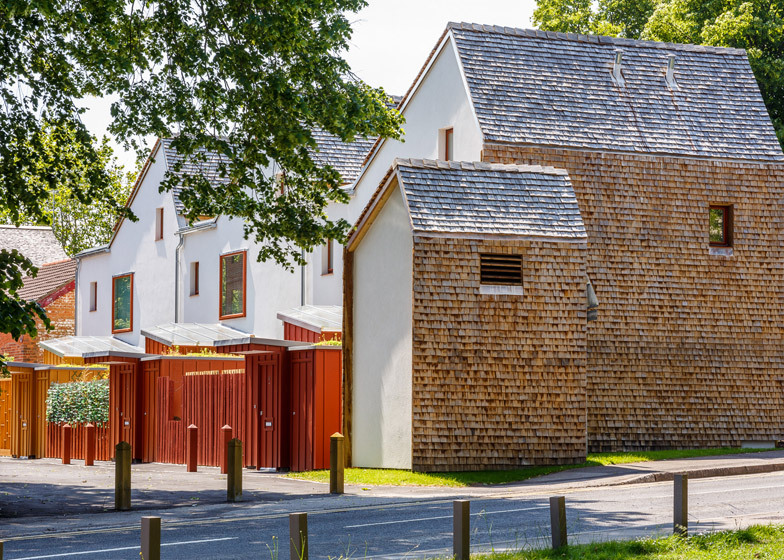 Alison Brooks Architects has also designed a development in Essex based on archetypal rural architecture that Brooks said aimed to create "a completely new and more sustainable suburban housing typology". For job opportunities at Ash Sakula, visit their company profile on Dezeen Jobs.